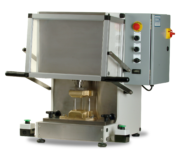 Models LS-1 & LS-6 Soap Presses are designed for pilot plant or low production usage. These presses are either pneumatically or electrically operated. The model LS-6 Press is designed for pilot plant or low production usage. This press is pneumatically operated and requires no electrical supply. The machine exerts approximately 6 tons of force thereby simulating the amount of force in a full size production soap press. The LS-6 is delivered complete including a heavy gauge work table.